Garut High School of Technology (in Indonesian, known as Sekolah Tinggi Teknologi Garut abbreviated STTG) for a long time has been known by activist of ICT as the center of ICT mobilization in Garut. The mobilization can be tracked until March 23rd 2003, while Indonesian Linux User Community (in Indonesia, known as Komunitas Pengguna Linux Indonesia abbreviated KPLI) in Jakarta give full support to the community of STTG as KPLI in Garut who socializing Linux to the citizen of Garut. 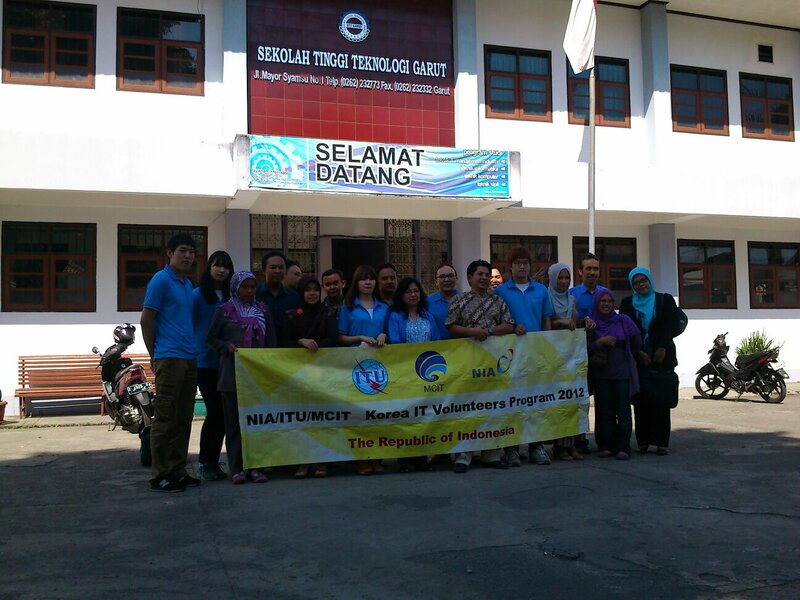 Since 2011, ICT activist from developers or mobilizers gathering in STTG held an ICT mobilization in Garut through weekly discussion forum until seminar and workshop twice in a year. And in this 2012, the challenge and also the opportunity to ICT activist in Garut increase with the coming of a letter of assignment from the Ministry of Communication and Informaticss (in Indonesia, known as Kementrian Komunikasi dan Informatika abbreviated KEMKOMINFO) to held activity with Korea IT Volunteers to doing KIV programs, cooperation beetwen KEMKOMINFO, United Nation Agency namely International Telecommunication Union, National Information Society Agency, and ICT Ministry of Thailand. support from PT Rahajasa Media Internet. The main activity of KIV programs held by Korea and Garut ICT Volunteers is ICT Seminar and Workshop held in August 4th until August 5th attended by Wardes and Community Access Point (CAP) Manager and particularly opened by Informatics Department of Garut Government. In the speech, the Head of Informatics Department appreciating the KIV programs and hoping he advantages from the programs like increase of ICT research activity, and cooperation with ICT Volunteers to advancing the social and economic life of peoples through empowerment of Wardes and CAP. This ICT Seminat and Workshop held to giving and submiting solution in the form of concept and skill to Wardes manager, based on existing problem founded by Korea and Garut Ict Volunteers while visiting the 13 Wardes and 1 CAP before. In the process to fulfill the objectives, Garut ICT Volunteers bring Korea ICT Volunteers to some number of school and community to knowing each other about culture, such as STTG, Garut University, Al-Musaddadiyah Islamic School, SMK Ciledug, SMAN 5 Garut, SMK YPPT, SMAN 1 Garut, MAN 1 Garut, Pondok Pesantren Al-Musaddadiyah, and Asgar Muda art community. And to some number of tour location in Garut, like hotspring in Puncak Darajat and Cipanas, Bagendit Lake, Cangkuang Temple, Cikembulan Zoo, Leather Jacket Industries in Sukaregang, Batu Numpang, Cibiuk Restaurant, Sampireun Village, and Chocodot. Korea Ict Volunteers also seeing the facility of rocket launching in LAPAN, and meet with the chief of Pameungpeuk, another element of government and delegation of Major of Garut. In the speech in August 8th 2012, Major of Garut appreciating KIV programs and emphasizing the important of cultural undrstanding to spur the motivation in ICT development in Garut. In Farewell Ceremony of KIV programs on August 2nd 2012 in Jakarta, Garut ICT Volunteers have a chance to give the report to KEMKOMINFO Informatics Application General Director. And at last in August 15th 2012, after farewell to Prof. Dr. M. Ali Ramdhani, advisory board of Garut ICT Volunteers, Korea ICT Volunteers going to Bogor to join to ICT Volunteers Go To School program before going home to Korea in August 24th 2012.